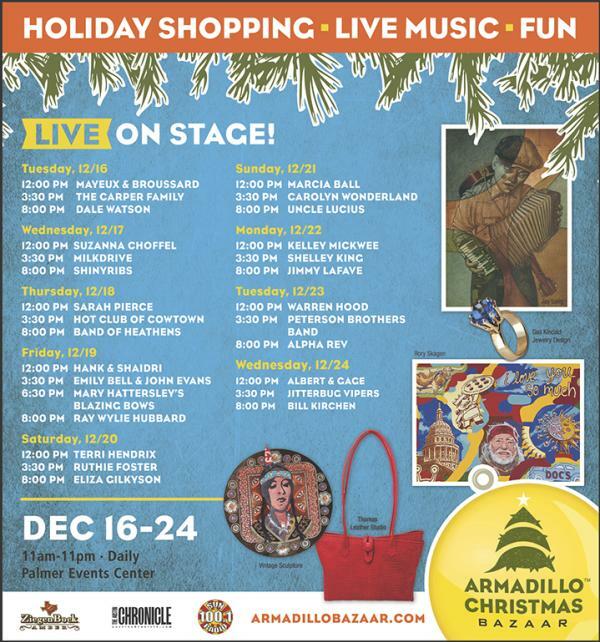 It&apos;s the most wonderful time of the year, and time for one of Austin&apos;s favorite holiday traditions The Armadillo Christmas Bazaar, December 16-24, 2014! Stop by do some holiday shopping or just come and kick back by the stage. Shop for the perfect gift while enjoying live local music and sips from a full bar. This year&apos;s Bazaar features an amazing selection of distinctive gifts; from statement-making collectible fine art to distinctive and modestly-priced stocking stuffers. Visitors can explore an amazing array of handmade items from more than 160 artists. As always, their music lineup does not disappoint. Count down to the big day with your favorite Austin musicians like Dale Watson, Ray Wylie Hubbard, Ruthie Foster, Marcia Ball and many more. The event is held December 16-24from 11 a.m. to 11 p.m. at the Palmer Events Center and is $7 for a single day pass. Kids 12 and under are free. Paid parking is available in the Palmer Events Center parking garage.